Grandmaster Sam F Chin touches fingertip to fingertip with one of the students in the room. The student moves his hand up and down, side to side, while Grandmaster Chin’s own hand moves through the air in perfect unison, like a reflection on the other side of a mirror. Grandmaster Chin’s words hang in the air of his Los Angeles hotel room as we try to digest their meaning. Half a dozen students from around the western United States have gathered here to listen to the Grandmaster speak about some of the philosophy and concepts behind his family’s martial art of I Liq Chuan (mental/physical martial art, 意力拳). The topic being discussed is using awareness to “find the center”, a vital concept in the art he’s spent the better part of the last 20 years traveling the world to share. This meeting is something that Grandmaster Chin often refers to as “being like a ring in the nose of a bull,” or “catching the tip of a spear.” Comparing the opponent’s force to a spear, he explains, once the tip is under your control, you can neutralize or redirect it away from yourself as you need. 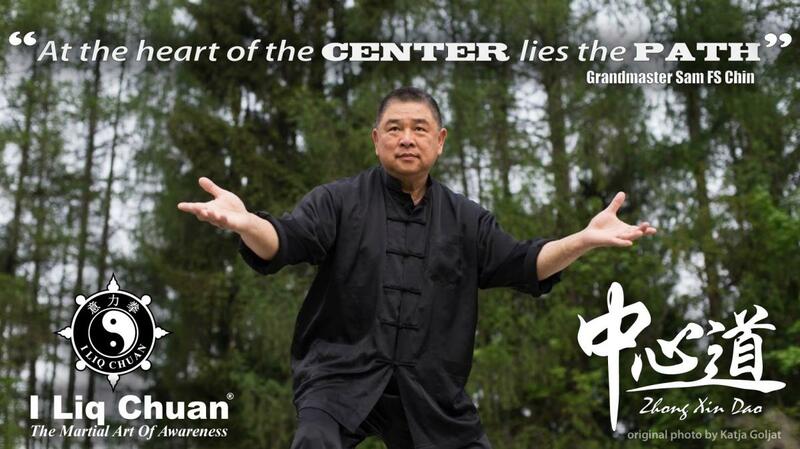 Circle to center, center to center and center with cross are technical terms describing three qualities of what Grandmaster Chin calls “engagement”. Learning to observe the point of contact to find these three qualities is practiced in the most fundamental of I Liq Chuan’s partner exercises, spinning hands. Similar to the rou shou (soft hands, 柔手) of Ba Gua Zhang, students repeatedly wind their arms around each other. With the attention on themselves first, the principles of correct alignment and relaxation, learned in the jibengong (fundamental exercises, 基本功) are reinforced under pressure, and then slowly the attention is expanded to include the point of contact with the opponent (partner) to observe the changes of solid and empty. Looking for gaps at the point of contact, every student learns to engage with the opponent in such a way that they begin to create a spherical force that has the qualities of both offense and defense. “Before you can strike me, you must first pass this point, but how are you going to pass when I’m always meeting you there?”, laughs the ever-smiling Grandmaster Chin. As the evening progresses, the discussion returns many times to the importance of affecting the opponent’s mass. While being able to manifest circle to center creates stickiness and defense energy, it’s only one side of the triangle of engagement. In order to refine one’s control over an opponent to affect the stability of their stance, you must manifest the quality of center to center. Japanese arts like Judo and Aikido refer to this as kuzushi; or ‘breaking the opponent’s balance’. Center to center has the quality of making the opponent feel like a piece of furniture. By creating slightly odd joint angles or “bunching” their soft tissue, you can effectively “lock” an opponent’s structure making it nearly impossible for them to relax without opening themselves to direct attack. This involuntary stiffness leaves the opponent’s balance much easier to control, rendering them much less of a threat. He goes on to explain that while this might seem obvious, the redundancy is deliberate. Like the repetition of a mantra, it hammers home a critical concept by bringing it to the direct attention of the student. Circle with cross can be said to have two main points. The first point is knowing which arc, or quarter, of the circle you’re propelling at any given moment, and second, being aware of which half of the circle you’re on. So we can better understand he has a student hold his hands up, forming a diamond with the thumb and index finger. Placing his finger below the uppermost tip of the diamond, he says, “if you are on the other side, how can I attack you until I pass the highest point? There’s no way. I don’t have the spacing.” The concept is similar to “line of sight”, from the point of contact to the opponents mass. Read more in GM Chin’s book “The Martial Art of Awareness”. Although most of us have heard him discuss engagement, and finding the center before, the repetition and depth of tonight’s discussion are welcome. For the long term students, the three qualities of engagement; circle to center, center to center and center with cross, are becoming more clear. Wherever the opponent touches you, you try to meet them there directly, join the centers to control and find the cross to maintain the center and see the full and empty for attack and defense. Finally Grandmaster Chin closes with an admonition. There’s no other way to recognize these qualities other than through awareness.